VIII International Scientific Forum "Modern Germanic Studies: Scientific Discussions"
The forum began with the “emotionally discursive” greeting of the co-chairs of the organizing committee: V. Samokhina and V. Krivenko, who congratulated all the guests and participants and wished great scientific achievements. 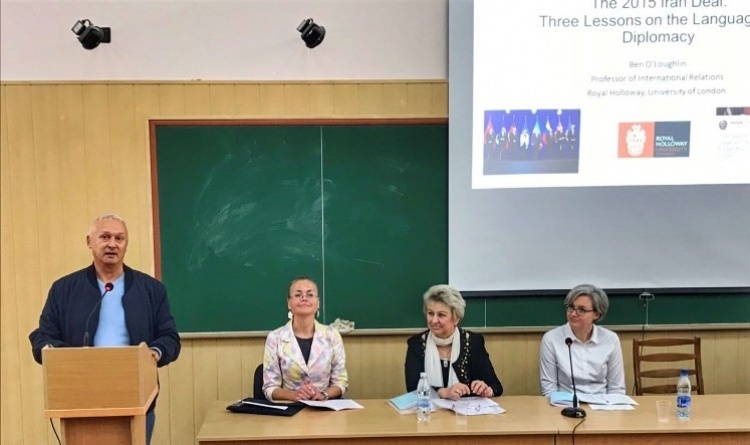 The first to present his report was a professor from Royal Holloway, University of London (UK) – Ben O'Loughlin (Professor of International Relations), who for the second time attended the School of Foreign Languages of V. N. Karazin Kharkiv National University. 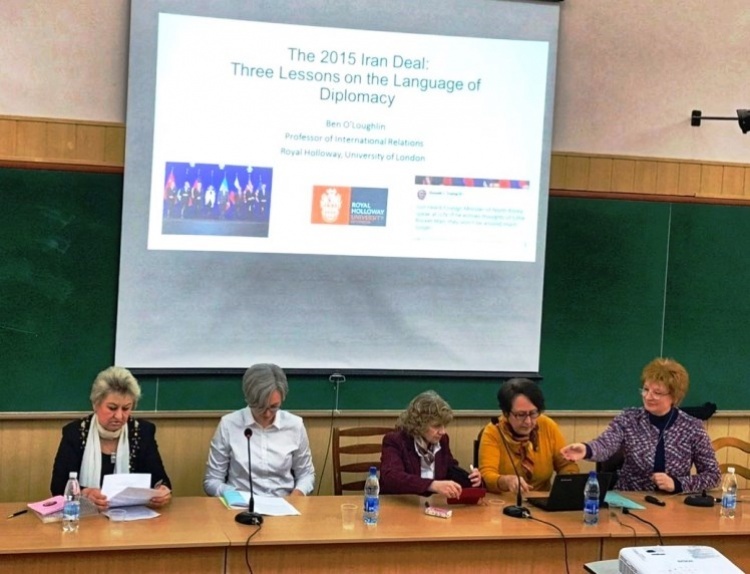 The professor presented an interesting report on a very relevant topic "The 2015 Iran Deal: Three Lessons of the Language of Diplomacy". 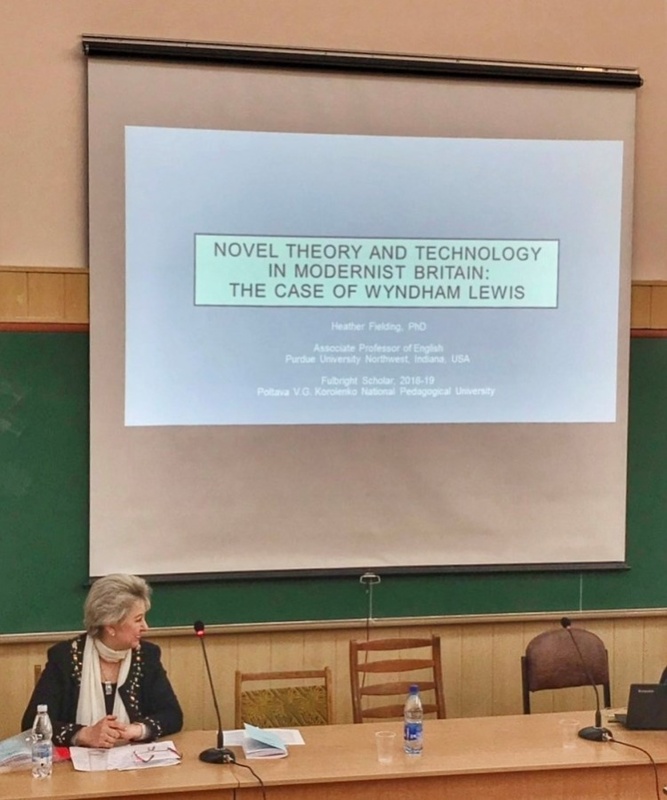 The second speaker was a professor from Purdue University Northwest (USA) – Heather Fielding (PhD, Associate Professor of English), her report on the theme «Novel Theory and Technology in Modernist Britain: The Case of Wyndham Lewis» plunged us into the world of literature. A very interesting carnival report by Victoria Samokhina (Head of the Department of English Philology, Dr. of Philology, Professor, Academician of Higher School of Ukraine) – "Carnival in the light of lingo-creative activity of Homo Artifex" has become the "positive note", which concluded the plenary meeting. After the lunch break, very emotional and lively Discussion round tables began, where scientists from different countries of the world took part: Great Britain, USA, France, the Netherlands, Germany, Ukraine etc. 6. Actual issues of linguistic stylistics and text linguistics. The workshop included Vera Tersteegen master class (DAAD Charkiw) – Kreatives Schreiben im Deutschunterricht: ein Praxis-Workshop. The organizing committee of the conference expresses deep gratitude to all those who participated in the organization of the conference, the work of the plenary session and discussion tables, the master class, took part in the conference by correspondence and all those who made the conference effective, successful and sincere.